The Stickley factory employs some 900 people (up from only 22 people in 1974) from 36 countries, running two shifts in a huge factory, where the Audis (the family that bought Stickley in 1974) have combined multimillion-dollar investments in technology with Old World craftsmanship to make for a successful wood furniture company. There is no doubt in my discriminating mind that the Stickley brand is excellent; actually better than the product Stickley originally produced – because they have better glues, better finishes, machines that can cut more accurate joinery more efficiently and almost endlessly – then could be done back in the day. So what did I glean from the tour, that I can use in my own one-man shop? Efficiency is King. You’ve heard the old adage, “Time is money”, and that’s very true in the production woodshop. The longer you take to make a piece, the more your labor per hour, which means less profit. The faster you can produce a product, in terms of taking it from rough lumber to a finished piece, is also a factor in your profit. 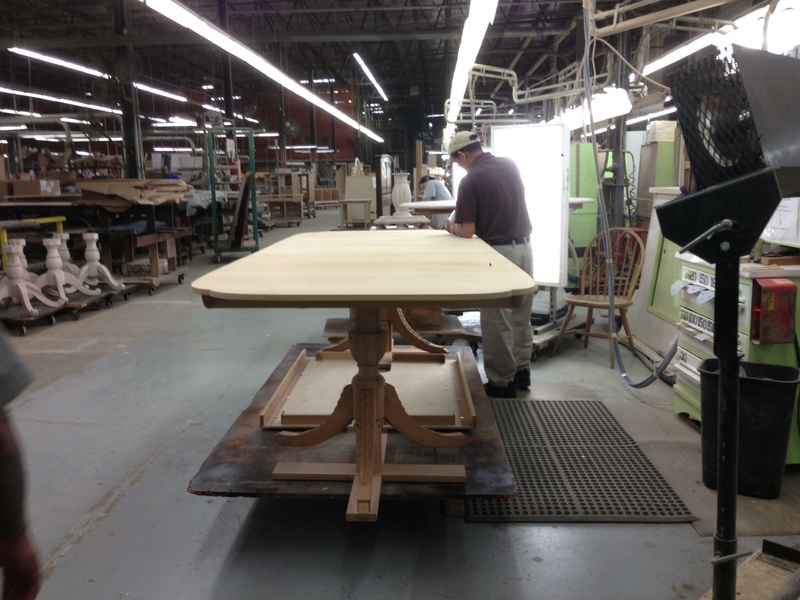 Stickley uses machines to do work that must be accurate and quick – such as cutting tenons or mortises – because in doing so, they add value to their product, in that the piece would have more solid joinery, and appear nicer, not to mention cutting costs on how long it took to make that – table leg, stile, panel. In my next big project, a large mission desk, I’m going to try having my sawyer joint and plane and final dimension some of the work – to see how much time it saves me (money, sawdust, etc). Use machines when you can, and hands where you can see it. Think of it this way – what value is added for your customer by making tenons or mortises by hand (for instance), when a machine can do it more accurately and quickly? Conversely, fitting a drawer, picking out the best wood, hand finishing a topcoat – those are all things that DO add value for the customer. If you are going to spend costly time on a project, do it where it can be seen and appreciated by your customer. Imagine, if you will, having all the parts for that (for instance) desk delivered to you; the parts are dimensioned and sanded to your requirement. All you have to work on is assembly and finishing – the things that really matter. Maybe it’s worth it to have a bigger shop dimension parts for you? My sawyer does it for only $50 an hour, and with his bigger machines, I’m sure he can get a lot done in an hour. People expect the best – and will pay for it. People know the Stickley name for quality – and it better be there. They are willing to pay top-dollar for the best, and let’s face it, at least for mission style stuff, Stickley is the number one national (if not international) brand. Your reputation is everything. If you start cutting corners, and quality suffers, people aren’t going to love you anymore, regardless of cost. When people want the very best, honestly, they come up with the money. So there you have it, some lessons from an amazing furniture company. Maybe I am waaayyyy too naive in this business but to be honest with you, I am offended by this article and your take on it. Apparently, the only processes “that matter” are assembly and finishing. The faster you can produce it, the faster you get paid.. period. End of story. If you truly feel this is the best way to work wood………….having someone else cut, shape, sand, form, and fit your pieces so all you have to do is assemble it and finish it, then mister, you are a fraud as a woodworker. You sir, do not work wood. You build kit furniture and pass it off as your handwork. Thats fraud pal. you miss the point of this craft completely. When you design and build aperiod reproduction, you embark on an extension of a craft that has been in existance for hundreds of years. you do it because you are proud to be part of a woodworking tradition that has existed for years and years. i’m not saying its a bad thing to want to make a profit. machines are expensive. wood can be. Kids dental bills are expensive. there’s a house payment and food etc, etc. I know these things. Faster processes help a great deal. But what you espouse is plain wrong if you hold yourself out to be a woodworker. Enough of the name calling, Drew. I certainly understand the process of “working wood”; in fact, the designing is every bit as interesting to me as the actual producing. I do not build “kit furniture” – and if you read more than this article, you’d know that. I actually don’t do ANY mass production – not even two at the same time, so what are you talking about? My point in this article was, if you are going to be making several of the same piece, it does make things more efficient, and more productive, and therefore, more profitable. What is wrong with streamlining your production, if you are out to actually make woodworking a full time profession? Isn’t that the logical thing to do? If I hired out a guy to turn spindles for me, because he had more experience and better equipment then I had in house, what’s the difference between him doing it at his place, or hiring him in my shop? That’s like telling a chef “Hey, you’re a fraud because you didn’t grown your own vegetables and chop them by hand!”. C’mon, man, get off your high horse. Do you use power tools? Isn’t that being a fraud too? I mean shouldn’t you really “work” the wood and saw by hand? Have at your reproductions, which could also be considered a “fraud” because you didn’t design it, did you? I design most of my stuff, because I DO understand woodworking. So before you come off like that on me again, think twice.